Today is the launch of the new KBShimmer Early Summer 2014 Collection and I have the last 3 polishes I received for review to show to you. These are the new textures and I have to say they are pretty cool. The polishes are not super textured. They contain quite a bit of glitter so they are chunkier compared to something like Zoya's regular PixieDust polishes, but they are not as chunky as the newer Zoya Magical PixieDust shades. The textures all have a jelly base and dry to a semi-matte finish. I got full coverage with all three shades with just 2 coats, but I did dab on a bit more polish in a few spots that seemed to not get as much glitter. And I wore these without top coat, to keep the textured finish. First up is my absolute favorite of the entire Early Summer Collection, Partners In Lime. 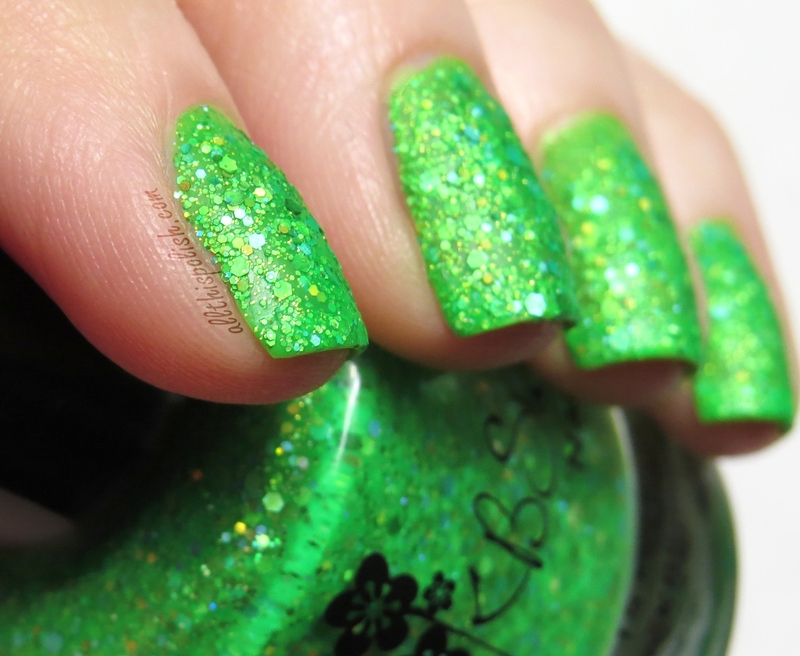 I love this bright lime jelly base, containing lime green, aqua and gold holographic glitters. I wore this polish again after swatching but with top coat and some stamping, and the glitter really made the whole design pop. I'm hoping to get a separate post up on that mani in the next few days. The 2nd texture polish is a bright turquoise called She Twerks Out. She Twerks Out is full of holographic glitters in teal, lime green, aqua, and violet. Really easy application in just 2 coats, with just an extra dab or two near the tips to cover a few spots of visible nail line. The last of the 3 textures is a bright purple called Too Pop To Handle. The jelly base in this was more opaque, I applied two coats and didn't feel like there were any spots I needed to touch up. 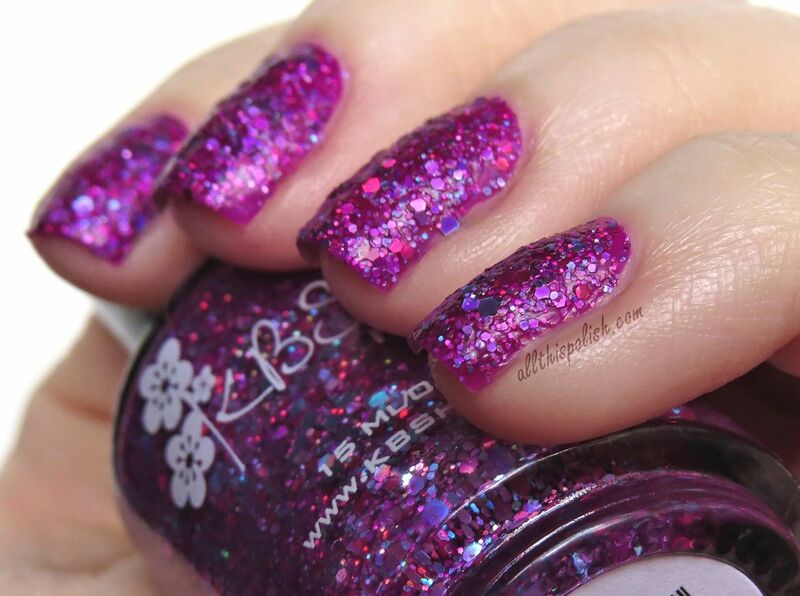 Too Pop To Handle contains violet, magenta, pink and aqua holographic glitters. It had a smooth formula, as did all three of the textures. And all three, when dry, had the same degree of texture to their finish. I have to say that at first I was a bit worried when I heard KBShimmer was releasing some textured polishes, just because there are so many textured polishes out there already. But I ended up really liking these three textures a great deal, especially because of the multi-colored glitters mixed in. I've only tried top coating Partners In Lime, but I had great results so I plan to try it out with the other 2 textures and use them as a base for some nail art in the near future. The texture polishes retail for $8.75 each. The textures, as well as the entire Early Summer 2014 Collection, are available for purchase starting today at KBShimmer.com. Today I have some of the new holographic polishes that KBShimmer will be releasing this Friday, May 23rd, as part of the Early Summer Collection 2014. There are 6 holo polishes in all. I have the 3 more neutral colors to review for you. For each shade, I am showing 3 coats of polish without top coat. All 3 of the holos had quite smooth formulas, and I had no issues with application. First up is In Bare Form. This post will be a bit more picture heavy than the previous post, so follow the jump for the rest of the swatches. This coming Friday, May 23rd, KBShimmer will be releasing their new Early Summer 2014 Collection. There will be 12 polishes in this new collection, and throughout the next several days, I'll be previewing 8 out of the 12 shades for you. Let's start with 2 of the creams in the new collection. First up is Low & Be Bold, an extremely bright blue, slightly jelly polish. Shown is 3 thin coats of Low & Be Bold without top coat. Application was a breeze. It covered completely in 3 coats. There is just a hint of visible nail line showing up in the pictures, but in real life I actually didn't even notice it. You might even be able to get away with full coverage in 2 thicker coats. 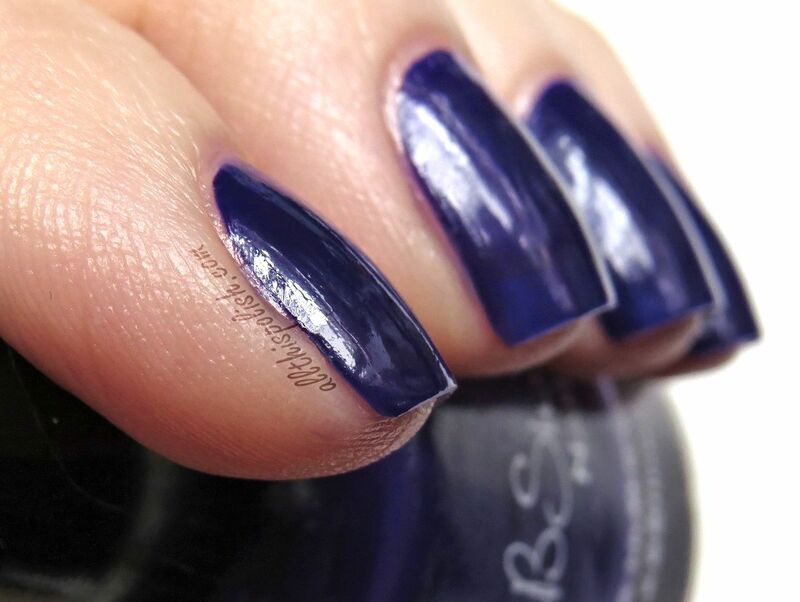 The second cream I have to show you is called Right As Reign, which is a deep, bold purple. It also has a bit of a jelly finish to it, but it is far more pigmented compared to Low & Be Bold, so it doesn't come across as squishy as its blue counterpart. Right As Reign covered completely with just 2 coats. The swatches below are also shown without top coat. Low & Be Bold and Right As Reign, as well as the 3rd cream in the collection, Let's Not Coral, will retail for $7.50 each when released on May 23rd at KBShimmer.com. 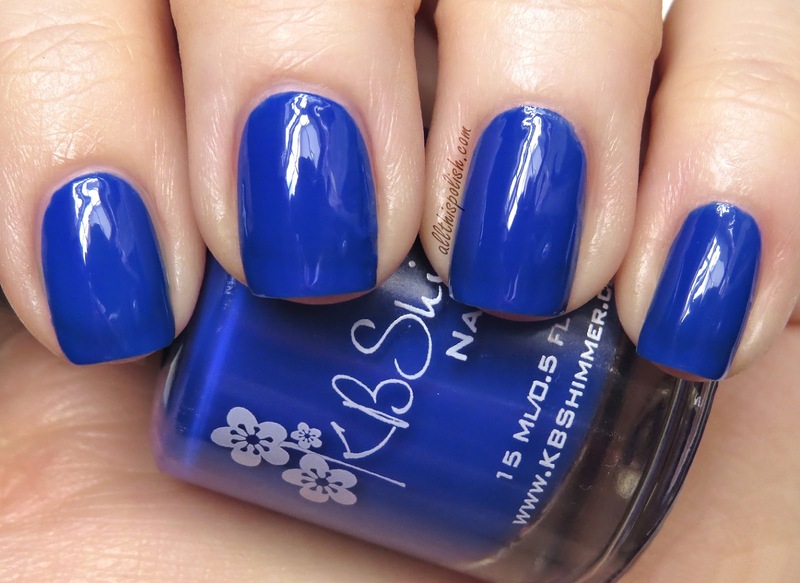 You can also follow KBShimmer's Facebook page for more blogger swatches from the collection. I picked up Milani Sugar Rim a few weeks back, so when I decided to cut back my nails, rather than deal with a patch when my index nail cracked, I reached for Sugar Rim. 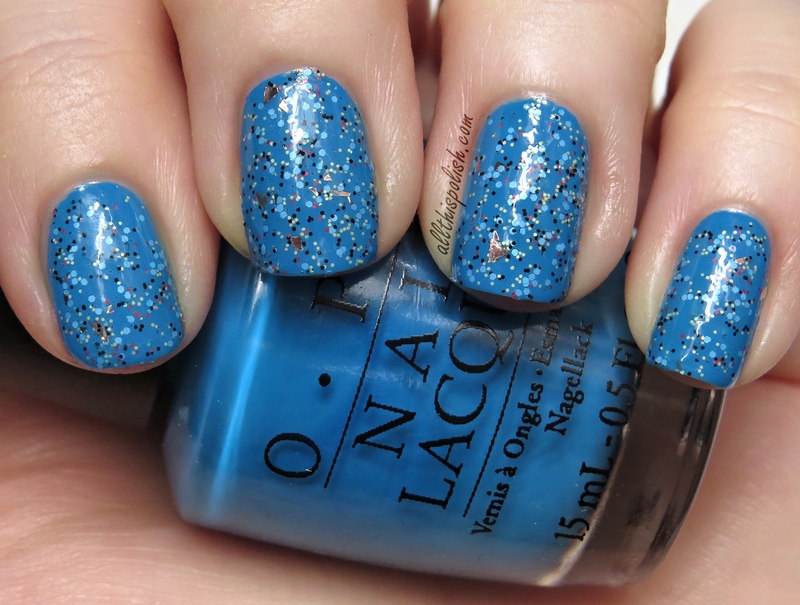 I wore one coat of Sugar Rim over OPI Ogre-The-Top Blue. Sugar Rim is a matte glitter in a clear base, and was super easy to apply. I love the mix of colors in this glitter. There's black, red, pastel blue and a pale yellow. There's also some metallic silver shards mixed in, which honestly, I still can't decide if I like or not. There's not a ton of silver pieces in the glitter mix, so they don't overpower the polish, but there's a small part of me that thinks I'd love the glitter so much more if they hadn't been added at all. Shards and all, I really liked the way the glitter looked over this blue base. I used three coats of OPI Ogre-The-Top Blue. But I'd also like to do some experimenting on a nail wheel to test out some other colors to use as a base for Sugar Rim. I can see this working really well over quite a few different colors! If you follow me on Instagram, you may have seen I had a little trim about 3 weeks back due to a crack on my index nail. But a little while before that, when my nails still had some length to them, I wore this Spring-like (maybe, sorta) design over OPI My Vampire Is Buff. However you may categorize it, I was happy with the final look. It started as a dotticure, in my head anyway, but on the nail it wasn't quite what I had originally pictured. So I decided to stamp over it to try and hide/salvage it. The final mix of designs and colors really worked well together, and I liked the end result so much more than I thought I was going to. 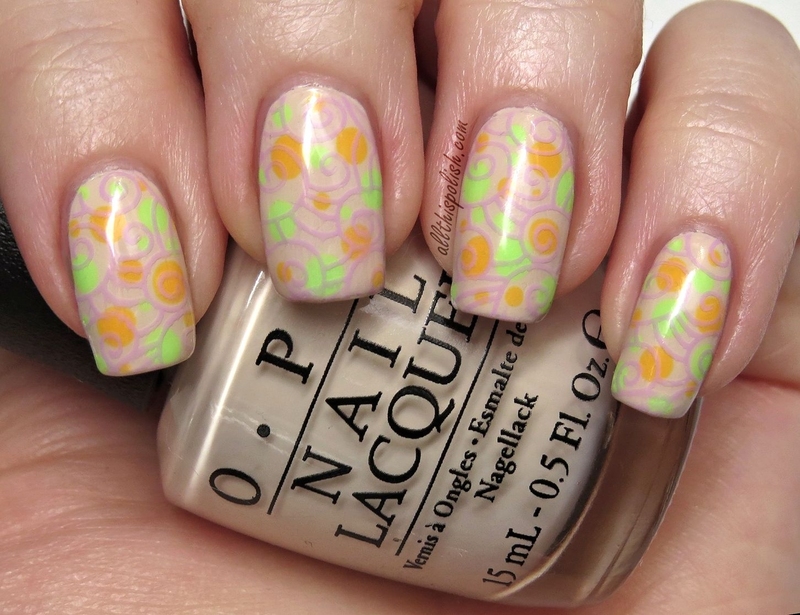 The dots were made using two China Glaze City Flourish Collection polishes, Grass Is Lime Greener and Metro Pollen-tin. 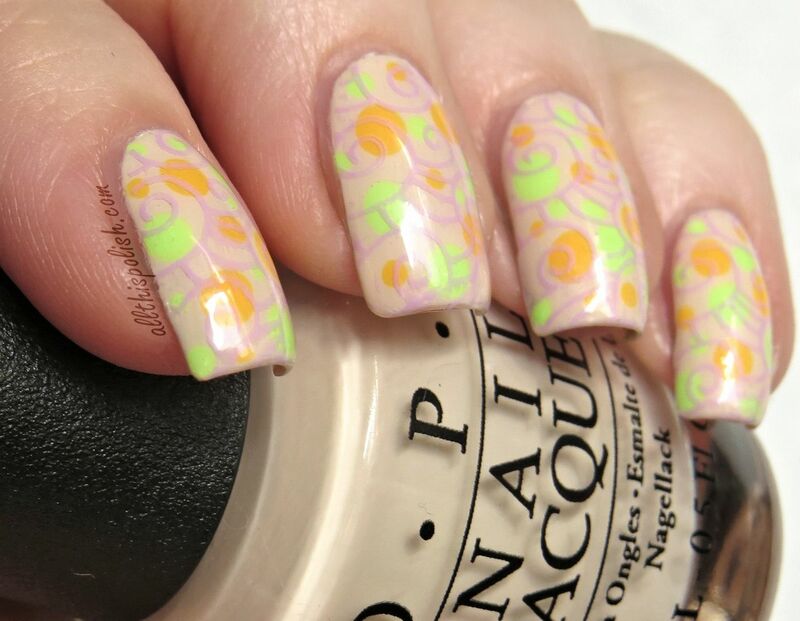 The swirl design was stamped using Konad Special Polish in pastel violet and an image from Nailz Craze plate NC02.